Global Artificial Intelligence as a Service Market is expected to reach USD 20.2 Billion by 2024 from USD 1.25 Billion in 2016 at a CAGR of 48.9%. This is a comprehensive global report focused on the current and future prospects of the global Artificial Intelligence as a Service Market. This report is a consolidation of primary and secondary research, which provides market size, share, dynamics, and forecast for various segments and sub-segments considering the macro and micro environmental factors. 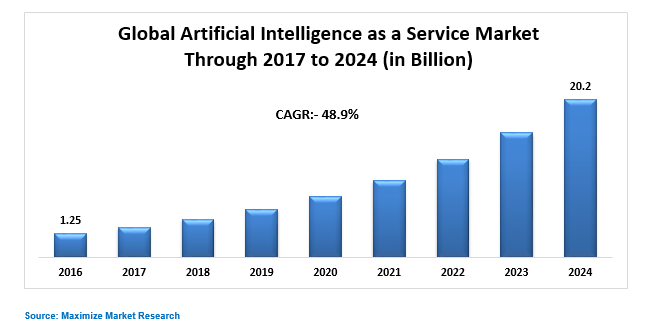 An in-depth analysis of past trends, future trends, demographics, technological advancements, and regulatory requirements for the global Artificial Intelligence as a Service Market has been done in order to calculate the growth rates for each segments and sub-segments. The key driving factor for this market include the rising adoption of the AI powered service in the form of application and application programming interface and the rapid growth in the innovations of the service are the key growth factors for this market in the forecast period. The machine learning and deep learning technology segment among the technology segment is anticipated to hold the largest market share, while the natural language processing technology is projected to grow at a higher CAGR during the forecast period. The natural language processing technology has various features such as it is capable of understanding user behaviors , that is why it helps in delivering enhanced customer experience. Geographically, the Global Artificial Intelligence as a Service Market has been segmented into North America, Europe, Asia Pacific, Middle East & Africa and Latin America. The swift growth of the market in the APAC region is anticipated to dominate the market over the forecast period majorly due to various factors, such as growing awareness of AI as a service among various verticals and growth of the massive amount of data, due to the increasing use of digital technologies are expected to make APAC a high potential market for growth. • Global Artificial Intelligence as a Service Market analysis and segmentation with respect to service type, software tool, service, technology, organization size, vertical and geography. The research methodology used to forecast and estimate the Global Artificial Intelligence as a Service Market was done by collecting data about key vendor revenues via secondary research, which includes databases & directories (Bloomberg BusinessWeek, D&B Hoovers, and Factiva). Vendor offerings have also been considered in order to determine the market segmentation. The bottom-up approach was employed to estimate at the overall market size of the Global Artificial Intelligence as a Service Market, which was derived by collecting the revenues of the key players in the market. 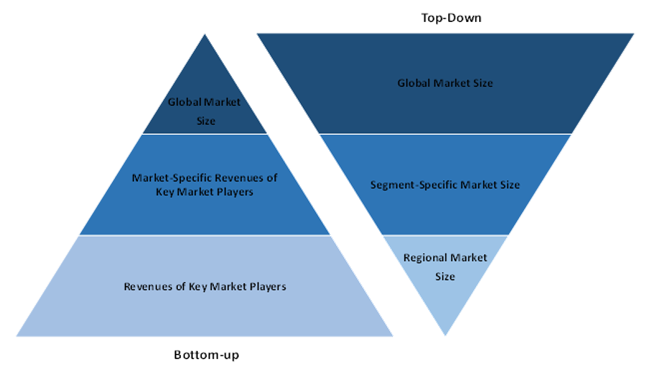 After estimating the overall market size, the market was categorized into several segments and sub segments, which were then verified via primary research by conducting extensive interviews with senior, such as Vice Presidents (VPs), Chief Executive Officers (CEOs), directors, and executives of Global Artificial Intelligence as a Service Market globally.